Radiation oncology or radiation therapy is therapy to stop cancer cells from multiplying and cancer to spread and result into fatality. Radiation oncology uses ionizing radiation to control or kill malignant cancer cells and cure the disease permanently. According to the WHO, the number of new patients of cancer is expected to grow by 70% in the next two decades. 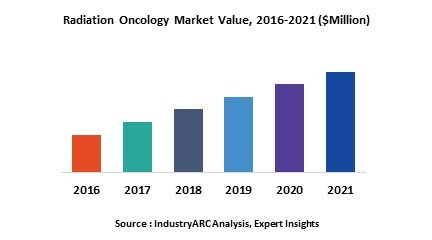 The growing number of cancer patients around the world is the chief driving force behind the global radiation oncology market’s growth however higher cost and adequate infrastructure in the major parts of the world is expected to be key restraining factor for the radiation oncology market. Geographically North America dominated radiation oncology market driven by best in the class healthcare infrastructure, advanced facilities, higher awareness, higher technological penetration and higher spending by the citizens towards healthcare expenditure. North America was followed by Europe and Asia-Pacific as second and third largest market for radiation oncology market. Asia Pacific is projected to have fastest growth, owing to rapidly increasing healthcare infrastructure, increased spending, government initiatives and increasing awareness amongst population, and growing medical tourism industry in developing nations such as China, and India in this region. This report identifies the global radiation oncology market size in for the year 2014-2016, and forecast of the same for year 2021. It also highlights the market drivers, restraints, growth indicators, challenges, and other key aspects with respect to global radiation oncology market. 11.1. Varian Medical Systems, Inc.
11.6. C. R. Bard, Inc.
11.9. Mevion Medical Systems, Inc.